Bhikkhuni Dhammanandi was bom in 1971 in Vietnam. In 1992, at the age of 21 she completed her Bachelor's degree from the Open Economics University . In the same year she became a nun in the Theravada tradition. She practiced at Buu Long Monastery. In 1994 she journeyed to Burma and remained for 9 years—studying Buddhism for 2 years, and meditation for 7 years. In 2002 at Tapodhanaramaya Temple in Mount Lavinia , Sri Lanka , she ordained as a Theravada Bhikkhuni. She has taught meditation and Dhamma abroad, just returning from Brisbane , Australia to teach at the Vietnamese Meditation Center of Brisbane. She has also taught in Thailand . Bhikkhuni Dhammanandi emphasizes teaching both Dhamma and meditation. She conveys the message of the importance of study so that women can become excellent Dhamma teachers, and the importance of teaching meditation so that people can open their eyes. 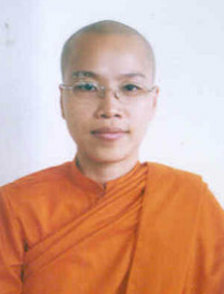 Bhikkhuni Dhammanandi in 1992 became a nun upon the inspiration of her uncle who is a Theravada Buddhist monk in the USA . Her sister is also a nun, a Maechee, and lives in California , USA . Personally, Dhammanandi became a nun in 1992 in order to first help herself, and then to help all women who want to become nuns or any woman who is suffering. When she lived in Burma she helped Burmese nuns. Now as a Bhikkhuni she is happy to help other women to become Bhikkhunis, and encourages them to study hard. She now awaits the return home to Vietnam of a friend who is a Bhikkhuni and working on her Ph.D. abroad. Upon her friend’s return home, they will work together to improve the status of Theravada nuns.